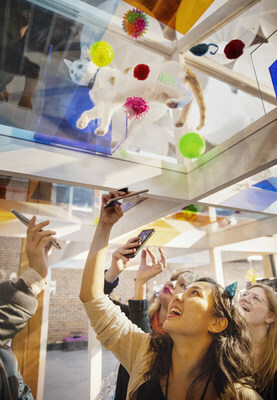 LOS ANGELES, Jan. 18, 2019 /PRNewswire/ -- The Cats on Glass Gallery, presented by Fresh Step® Clean PawsTM, is an interactive pop-up with a purpose that gives cat lovers a one-of-a-kind experience in an effort to help more shelter cats find forever homes. The Gallery opened its doors last night to a waiting crowd for a limited time in downtown Los Angeles (1147 South Hope Street) and will remain open for the next ten days. LA feline fans will now have their chance to celebrate cat love while supporting a great cause. Fresh Step's mission is to help every shelter cat find - and stay in - a forever home. Each interactive exhibit within the Cats on Glass Gallery features adoptable cats and an element of glass to give cat lovers a chance to literally picture themselves with, and even adopt a cat. Fresh Step will be covering the fee typically associated with adoptions throughout the duration of the exhibit to help alleviate barriers to bringing a cat home. "I'm thrilled to be partnering with Fresh Step again at their second Cats on Glass Gallery where we will continue to spark interest and encourage more shelter cat adoptions," said Fresh Step spokesperson Hannah Shaw, known in the cat community simply as 'Kitten Lady'. "It has been remarkable to see the fan reaction and I can't wait for LA to experience this cat lovers' dream." Curated by Fresh Step® Clean PawsTM to dramatize the benefits of the low-tracking litter, the exhibit will feature the same larger than life cat display, pom-pom room, me-owm meditation center, adoption lounge and feature exhibit: live Cats on Glass Playhouse that attracted waiting crowds in New York with a few Hollywood additions, including adoptable cats from spcaLA and a cat-lebrity Walk of Fame. "We are so thrilled to partner with Fresh Step for Cats on Glass Los Angeles," said spcaLA President Madeline Bernstein. "spcaLA is always ready to find unique and innovative opportunities to showcase the wonderfulness of our feline friends." Guests are encouraged to come, snap and share their cat love throughout the gallery, where an Instagram post will trigger a litter donation to shelter cats at spcaLA. Participants will receive an exclusive cat-themed gift in return. More details will be available inside the #CatsOnGlass Gallery at the InstaShop. "There are pop-ups focused on candy, makeup and wine, so we thought 'Why not cats? '," said Lauren May, brand manager, Clorox Pet Products. "With nearly 300 million cat-related posts on Instagram, we know that people are posting about their feline friends and we wanted to tap into that conversation in a relevant way while bringing awareness to the many cats that don't yet have forever homes. Hopefully people will find their feline match at the Cats on Glass Gallery." Last night's grand opening featured Hannah Shaw and LA native cat-lebrity, Nala Cat, among VIP media and influencer guests. The Cats on Glass Gallery will be open January 18 - January 27, 2019 from 12 p.m. – 8 p.m. and is located at 1147 Hope Street (near 12th Street) in downtown Los Angeles. The Cats on Glass Gallery is a free event, however please consider a suggested $10 donation to our partner, spcaLA. For more information, video footage, and to RSVP and donate, visit www.CatsOnGlassGallery.com. For those not local or stuck in LA traffic, you can still take an inside look at the new Cats on Glass Gallery through our special Facebook Live interactive video tour with Fresh Step and surprise guests - famous felines and cat-loving influencers - at Facebook.com/freshstep. You can also follow along on Instagram by following #CatsOnGlass @FreshStep. Litter box rejection, mess and smell are pain points of cat owners, and may contribute to fewer successful cat adoptions. Based on the insight that one in three (34 percent) of consumers prefer litter with no scent, Fresh Step® Clean PawsTM litter will be available in Unscented starting in February 2019. Fresh Step® Clean PawsTM low tracking litter, 2018's top innovation in the litter category, can be found at grocery, pet specialty, mass merchandise and drug stores nationwide. To learn more about Fresh Step® Clean PawsTM low tracking litter, visit FreshStep.com. The Clorox Company (NYSE: CLX) is a leading multinational manufacturer and marketer of consumer and professional products with approximately 8,700 employees worldwide and fiscal year 2018 sales of $6.1 billion. Clorox markets some of the most trusted and recognized consumer brand names, including its namesake bleach and cleaning products; Liquid Plumr® clog removers; Poett® home care products; Fresh Step® cat litter; Glad® bags, wraps and containers; Kingsford® charcoal; Hidden Valley® dressings and sauces; Brita® water-filtration products; Burt's Bees® natural personal care products; RenewLife® digestive health products; and Rainbow Light®, Natural Vitality® and Neocell® dietary supplements. The company also markets brands for its industry-leading healthcare and commercial cleaning products under the CloroxPro® name. More than 80 percent of the company's sales are generated from brands that hold the No. 1 or No. 2 market share positions in their categories. Clorox is a signatory of the United Nations Global Compact, a community of global leaders committed to sustainability. The company has been broadly recognized for its corporate responsibility efforts, included on CR Magazine's 2018 100 Best Corporate Citizens list, Barron's 2018 100 Most Sustainable Companies, the Human Rights Campaign's 2018 Corporate Equality Index and the first sector-neutral Bloomberg Gender Equality Index in 2018, among others. In support of its communities, The Clorox Company and its foundations contributed about $20 million in combined cash grants, product donations and cause marketing in fiscal year 2018. For more information, visit TheCloroxCompany.com, including the Good Growth blog, and follow the company on Twitter at @CloroxCo.